NFL player Reuben Foster was arrested in a domestic violence incident in Tampa. 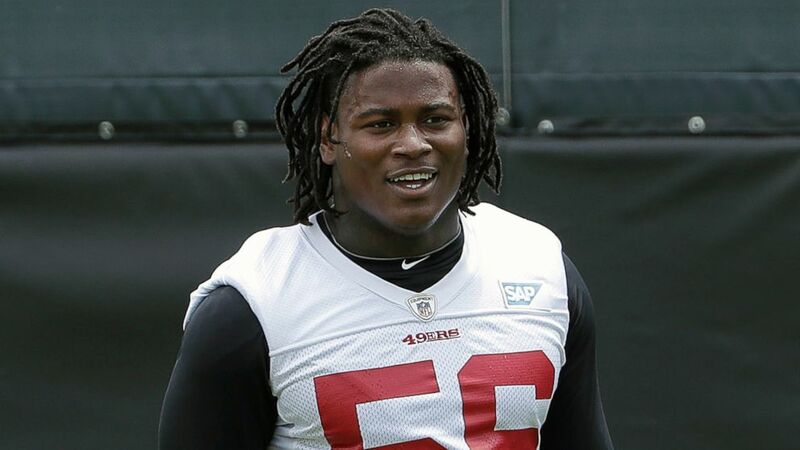 The San Francisco 49ers wasted no time in kicking linebacker Reuben Foster off the team following his arrest in Tampa Bay, Florida, on suspicion of battering a woman -- the second time this year he's been jailed in a domestic violence incident involving the same victim. The 49ers posted a tweet Sunday morning saying Foster, 24, was being released from the team. Foster was arrested after Tampa police officers were called to investigate a domestic violence complaint just after 9 p.m. on Saturday at the Grand Hyatt hotel in Tampa, where the team is staying as it prepares to play the Tampa Buccaneers Sunday afternoon. Foster -- a 6-foot-1, 280-pound linebacker -- got into a heated argument with his former live-in girlfriend Elissa Ennis, 28, that allegedly escalated into a physical confrontation, according to a criminal report affidavit obtained by ABC News. (Jeff Chiu/AP, FILE) San Francisco 49ers linebacker Reuben Foster walks on the field during a practice at the team's NFL football training facility in Santa Clara, Calif., May 30, 2018. Foster was arrested Saturday, Nov. 24, at the team hotel on charges of domestic violence. "The victim stated that during the altercation Foster slapped her phone out of her hand, pushed her in the chest area and slapped her with an open hand on the right side of her face," the police statement said. Officers took Foster into custody after they noticed an inch-long scratch on Ennis' left collarbone, according to police. The San Francisco 49ers are releasing Reuben Foster. Foster was booked at the Hillsborough County Jail at 11:11 p.m. He appeared at a court hearing Sunday morning and bail was set at $2,000. A judge ordered him to have no contact with Ennis. During the investigation, police learned that Foster and Ennis had previously lived together and were involved in an on-again-off-again relationship over the past three years. Earlier this year, Foster was arrested on suspicion of battering Ennis at his home in Los Gatos, California. Ennis initially told police officers who responded to the Feb. 11 domestic violence call that Foster hit her at least 10 times, dragged her out of his house, threw her to the ground and spit on her, broke her phone and threw their bulldog at her, according to police. 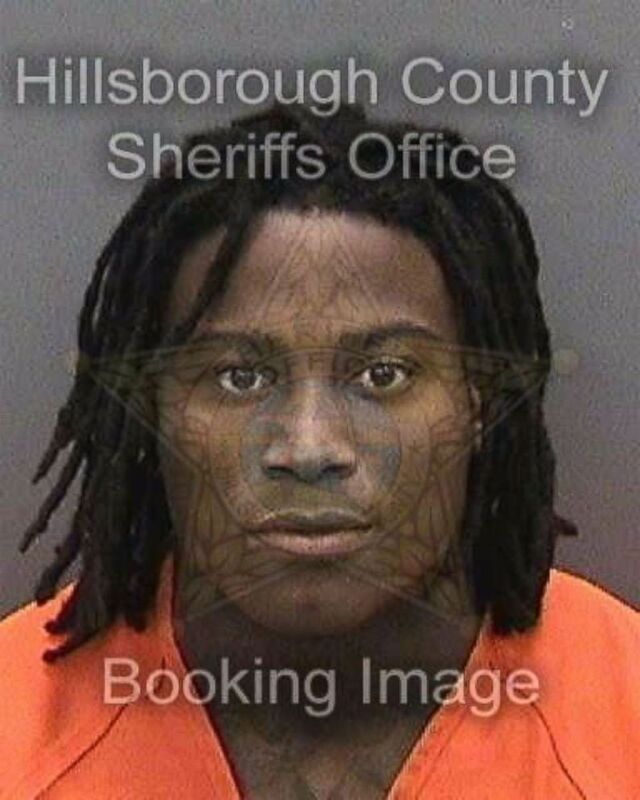 (Hillsborough County Sheriff's Office) Reuben Foster in an undated photo. Ennis later recanted her story during a court hearing, telling a judge that she concocted the story in an attempt to ruin Foster's career because she was angry at him. Santa Clara County, California, Judge Nona Klippen dismissed charges of domestic violence against Foster, citing "insufficient cause." Foster pleaded no contest to a weapons charge that was reduced to a misdemeanor and was sentenced to 232 hours of community service, placed on two years of probation and was barred from possessing any guns or ammunition. At the time, San Francisco 49ers head coach Kyle Shanahan said the team had a zero-tolerance domestic-violence policy. "We can promise you guys -- if there's someone whoever hits their significant other, girlfriends, some person like that, that person is not going to be on our team," Shanahan said. After Foster was cleared of the charges, the 49ers welcomed him back on the team. In 2017, Foster was the 49ers' first-round draft pick. Foster was suspended for the first two games of this season for violating the NFL's conduct and substance-abuse policies stemming from his arrest in Alabama on a misdemeanor charge of possessing marijuana.